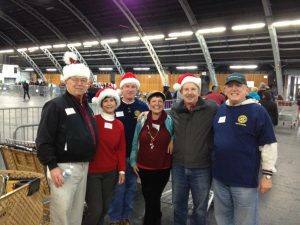 Each year, Santa Rosa Rotarians and family members descended on the Sonoma County Fairgrounds to participate in another Hands On Project. This project involved helping the combined Redwood Gospel Mission and Salvation Army to provide hot meals, haircuts, food boxes, and Christmas gifts to those in need in our community. A blue sea of Rotarian At Work shirts could be seen at the food boxing area where members placed a frozen chicken and other food staples into a cardboard box for families to take home to make a Christmas dinner. After the food was boxed, some more members rolled the boxes down a conveyor line where yet some more members had the filled boxes placed in a shopping cart. Each Rotarian is then assigned a family to either deliver the box of food to the family’s car, or to take the shopping cart to receive bags of gifts for children of all ages. The sparkle of eyes and huge grins of children learning that the bags are full of Christmas presents is a sight that none of the members there will ever forget. The shopping carts full of boxes of food and Christmas gifts are then wheeled by Rotarians all of the way out into the recipients’ cars. The event is a huge success each year. In the past, we had two separate shifts to help completely man the food and toy distribution area of the event. Attendance at the event has been estimated to be approximately 5,000 people, not including all of the hundreds of volunteers. If you have never participated in this event, it is truly a heartwarming experience. Volunteers were treated to free coffee and Christmas treats. Additionally, anyone in the community could obtain a free lunch or dinner from one of the buildings set up as a dining area.